The biggest news this week is the Supreme Court’s announcement that it will hear the Heartland v. Kraft case dealing with the requirement in 28 USC §1400(b) that patent infringement cases be filed “where the defendant resides” and the 1990 decision in VE Holding holding that patent suits can be filed in any district where the defendant makes a sale. In perhaps the most interesting decision of the week, the Circuit affirmed the district court’s efforts in Medgraph to comply with the Circuit’s and Supreme Court’s decisions in Akamai involving divided and induced infringement. In Power Integrations, the Circuit provides a good discussion of induced infringement and infringement under the doctrine of equivalents, and reverses the district court as to both. In United Construction, the Circuit affirms a default judgment as a result of defendant’s obstruction to any meaningful discovery. In U.S. Water, the panel reverses summary judgment of anticipation as to an “inherent disclosure” in the prior art but affirms that there was no inequitable conduct. Thanks to my Seattle colleague Yuke Wang for his help with this week’s report. In Akamai I, the Circuit held that direct infringement of a method patent requires a single party ‎to ‎perform every step of a claimed method and that there can only be joint infringement when the ‎acts ‎of another are attributable to the accused infringer through either an agency relationship or a ‎contractual ‎obligation. In Akamai II, an en banc Circuit left the direct infringement standard in place but ‎provided an independent inducement basis for divided infringement. Following Akamai II, Medtronic filed a motion for ‎summary ‎judgment of noninfringement. Each party had been held liable for infringement of the other’s patent(s) but in the present decision the panel reverses two rulings. In the words of the panel: “We have significantly reduced the scope of Fairchild’s ‎infringement liability in this case. As a result of our above ‎holdings, only the district court’s judgment that Fairchild ‎is liable for direct infringement of the ’851 and ’876 ‎patents remains untouched.” ‎ Specifically, the panel reverses a ruling that Power Integrations’ ’605 patent is not anticipated; vacates the judgment that Fairchild induced infringement of the ’851 and ’876 patents; and reverses a finding that Fairchild’s ’972 patent is infringed under the doctrine of equivalents. Because the panel’s rulings on induced infringement and the doctrine of equivalents are the most interesting part of the opinion, that is the focus of our much-shortened excerpt of the opinion, appended at “Read More.” In its original form, the opinion was almost 50 pages long. Induced infringement is defined in 35 U.S.C. § 271(b): “Whoever actively induces infringement of a patent ‎shall be liable as an infringer.” In order to establish active inducement of infringement, it is not sufficient that others directly infringe the ‎claim. Nor is it sufficient that the party accused of infringement was aware of the acts by others that ‎directly infringe. Rather, in order to find inducement, you must find that the party accused of ‎infringement intended others to use its products in at least some ways that would infringe the asserted ‎claims of the patent. However, that infringement need not have been actually caused by the party’s ‎actions. All that is required is that the party took steps to encourage or assist that infringement, regardless ‎of whether that encouragement succeeded, or was even received. Intent to encourage or assist the acts ‎that constitute direct infringement must be proven by evidence of active steps taken to encourage direct ‎infringement, such as providing products, advertising any infringing use, or instructing how to engage in ‎any use that is infringing. United Construction v. Tile Tech – The Circuit affirms a default judgment and injunction against a defendant who missed deadlines, misrepresented matters to the court, and destroyed evidence. To illustrate how egregious Tile Tech’s conduct was, the “Read More” excerpt from the opinion describes the behavior that supported these harsh sanctions. In evaluating the appropriateness of default judgment, the panel applies the factors from the Ninth Circuit’s Malone v. USPS case: (1) the public’s interest in expeditious resolution ‎of litigation; (2) the court’s need to manage its docket; (3) the risk of prejudice to the other party; (4) the ‎public policy favoring disposition of cases on their merits; and (5) the availability of less drastic ‎sanctions. Finding that all but factor (4) support default judgment, the panel has little trouble affirming the dismissal. The panel also affirms the permanent injunction, rejecting Tile Tech’s three arguments. An order enjoining infringing and “substantially similar” products is well within the court’s discretion. The requirement that Tile Tech turn over a mold that itself was not infringing but was critical in fabricating the infringing product was entirely appropriate. And finally, given Tile Tech’s inappropriate use of images of United’s products, projects, and drawings ‎on its website and in other marketing ‎materials‎, an injunction prohibiting such use was appropriate even though such use may not lead to a likelihood of confusion. Medgraph patents are ‎directed to methods for facilitating treatment of patients, whereby data relating to ‎‎“medically important variables,” for example, blood ‎sugar levels of a diabetic patient, are uploaded onto a computer and transmit‎ted to a central storage device, from which they can be ‎accessed remotely by medical professionals. ‎Medtronic manufactures and markets a CareLink System, which allows patients to upload data relating to management of their diabetes, including blood glucose readings, to Medtronic’s central computer server. The data are collected and stored so that the patients can keep an online record of the information, and/or share the information remotely with a healthcare provider. Ordinarily, when the governing legal standards change during an appeal, remand is an appropriate action. However, in this case, Medgraph has not pointed to any evidence that would permit attribution of patient- and doctor-performed steps to Medtronic for direct infringement under the standard of Akamai V invoked by Medgraph. In addition, the district court correctly concluded that Medtronic was not liable under a theory of indirect infringement, because indirect infringement is predicated on direct infringement, which is unaffected by the Akamai V standard. The evidence presented to the district court indisputably shows that‎ Medtronic does not condition the use of, or receipt of a benefit from, the CareLink System on the performance of all of Medgraph’s method steps. For example, Medtronic does not deny users the ability to use the CareLink System without performance of the claim step of ensuring detachment of the measuring device from the patient after each measurement. Nor does it offer an incentive for such detachment. Medtronic freely permits using the CareLink System without performing synchronization, and it denies no benefit to such users for their choices to do so. Patients can freely choose to bring their devices to their physician’s office and have their data extracted locally there. Patients also can print or email reports and bring them to their medical practitioner. Power Integrations and Fairchild are direct competitors in the power supply controller chip market. They have engaged in a long-running and multi-fronted patent dispute involving actions in the United States district courts and the USPTO. We have already heard appeals of at least two decisions that involved two of the very patents at issue here. Power Integrations filed suit against Fairchild alleging that Fairchild directly and indirectly infringed four of its patents. Fairchild filed counterclaims alleging that Power Integrations directly and indirectly infringed three of its patents. Each party denied the infringement allegations made against it and alleged that all patents asserted against it were invalid and/or unenforceable. The district court bifurcated the liability and damages phases of the case prior to trial. At the conclusion of trial, the jury returned a mixed verdict. The district court granted Power Integrations’ motion for JMOL of direct infringement of the ’605 patent but denied all other motions. Later, the court granted Power Integrations’ motion for a permanent injunction and enjoined Fairchild from selling and importing the products found at trial to infringe. The district court denied Fairchild’s motion for a permanent injunction. The parties raise twelve issues on appeal. The issues can be categorized as follows: (1) challenges to the district court’s construction of certain claim terms; (2) a challenge to the district court’s jury instructions; (3) a challenge to the verdict form adopted by the district court; (4) challenges to the district court’s denial of certain of the parties’ motions for JMOL; (5) challenges to the district court’s denial of certain of the parties’ motions for a new trial; and (6) challenges to the district court’s grant or denial of a party’s motion for a permanent injunction. Fairchild argues that it is entitled to JMOL that it did not induce infringement of the ’851 and ’876 patents or, at the very least, that it is entitled to a new trial on the issue. Before reaching the jury’s induced infringement verdict, however, we must first address Fairchild’s argument that claims 1 and 21 of the ’876 patent are invalid as anticipated. The jury found that neither Martin nor Wang anticipated claims 1 and 21 of the ’876 patent. The ’876 patent claims a “frequency jittering” circuit used in switched mode power supplies to reduce EMI emissions produced by the power supply. 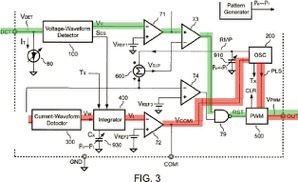 Martin and Wang each disclose a controller circuit used to reduce the EMI signature associated with a power supply’s oscillator. The circuits accomplish this reduction by varying the oscillator frequency through the use of a pseudo-random code stored in read-only memory (ROM). At trial, Power Integrations argued to the jury that the invention of the ’876 patent differed from the prior art references in at least two key ways: (1) the circuits of Martin and Wang do not vary about a “target frequency” as required by the district court’s construction of “frequency jittering;” and (2) the counters of Martin and Wang are not “coupled” to the digital-to-analog converter as the district court construed that term. The jury agreed and found that the claims were not anticipated by Martin or Wang. We find that the jury’s verdict was supported by substantial evidence. The jury found that Fairchild’s SG5841J- and SG6842J-type products literally infringed claim 18 of the ’851 patent; its SG5841J-type products infringed claims 1 and 21 of the ’876 patent under the doctrine of equivalents; and its FAN103-type products literally infringed claims 1 and 21 of the ’876 patent. The jury further found that Fairchild induced others to infringe these claims. Fairchild does not appeal the jury’s direct infringement verdicts. It does appeal the jury’s indirect infringement verdicts. We agree with Fairchild that the district court’s jury instruction misstated the law on induced infringement in a way that prejudiced Fairchild. We therefore vacate the jury’s verdict. Because we do not find that the record as a whole requires a finding of non-infringement as a matter of law, we do not go further and, as Fairchild requests, enter judgment in its favor. In order to establish active inducement of infringement, it is not sufficient that others directly infringe the claim. Nor is it sufficient that the party accused of infringement was aware of the acts by others that directly infringe. Rather, in order to find inducement, you must find that the party accused of infringement intended others to use its products in at least some ways that would infringe the asserted claims of the patent. However, that infringement need not have been actually caused by the party’s actions. All that is required is that the party took steps to encourage or assist that infringement, regardless of whether that encouragement succeeded, or was even received. Intent to encourage or assist the acts that constitute direct infringement must be proven by evidence of active steps taken to encourage direct infringement, such as providing products, advertising any infringing use, or instructing how to engage in any use that is infringing. Proof of intent to induce infringement may be based on circumstantial evidence, rather than direct evidence. This instruction left the jury with the incorrect understanding that a party may be liable for induced infringement even where it does not successfully communicate with and induce a third-party direct infringer. The Supreme Court has explained that the term “induce” as it is used in § 271(b) “means to lean on; to influence; to prevail on; to move by persuasion.” Global-Tech Appliances, Inc. v. SEB S.A., 563 U.S. 754 (2011). Each definition requires successful communication between the alleged inducer and the third-party direct infringer. We have further held that to prevail under a theory of indirect infringement, plaintiff must first prove that the defendants’ actions led to direct infringement of the patent-in-suit. A finding of induced infringement requires actual inducement. The inducement may be proven via circumstantial evidence. But the jury must still find that it occurred. The jury instruction incorrectly stated that liability exists even where no inducement actually occurred. This is contrary to the law. Power Integrations’ claim for induced infringement was a close call. Therefore, we cannot say that the instruction did not tip the scales in favor of Power Integrations at trial. We thus vacate the jury’s verdict that Fairchild induced infringement of the ’851 and ’876 patents. We must still address Fairchild’s argument that it is entitled to JMOL of no induced infringement. After all, if Power Integrations did not present sufficient evidence to allow a reasonable jury to find in its favor, a new trial on induced infringement would be unnecessary—and improper—regardless of the jury instruction given by the district court. Having reviewed the record as a whole, we cannot conclude that no reasonable jury—if instructed properly—could have found that Fairchild induced infringement of the ’851 and ’876 patents. Fairchild appeals the jury’s verdict that claims 1 and 2 of the ’605 patent were not anticipated by Maige. Power Integrations cross-appeals and argues that it is entitled to a new trial on induced infringement due to certain prejudicial statements made by Fairchild during trial. We find the jury’s verdict that Maige did not anticipate claims 1 and 2 of the ’605 patent unsupported by substantial evidence. We therefore reverse the jury’s verdict of no anticipation. As a result, Power Integrations’ cross-appeal is moot. The ’605 patent claims “a power supply regulator including a variable current limit threshold that increases during an on time of a switch.” Maige describes “[a] protection device for switch mode power supplies.” Like the regulator claimed in the ’605 patent, Maige’s protection device uses a current limit threshold to protect downstream components in the event of a power surge. The specific type of threshold employed by Maige depends on the mode of the protection device. When the protection device is in startup mode, Maige uses “soft start circuitry” to introduce an increasing current threshold that prevents a large in-rush of current. When the protection device is in its normal operation mode, Maige uses a fixed current limit. We find that the jury’s verdict is not supported by substantial evidence. Dr. Kelley testified at trial that (1) Maige’s current threshold increases “during the whole process of startup”; and (2) Maige’s power supply is on “for some period of time” during startup. Taken together, Dr. Kelley’s testimony is a concession that Maige’s current threshold “increases during the on time of the switch.” This is all that claims 1 and 2 require. The jury therefore lacked substantial evidence to find that Maige did not anticipate claims 1 and 2 of the ’605 patent. The jury found that claims 6, 7, 18, and 19 were not invalid. It further found that Power Integrations infringed the claims under the doctrine of equivalents, but did not infringe literally and did not induce others to infringe. Fairchild appeals the jury’s verdict that Power Integrations did not induce infringement of the asserted claims. Power Integrations cross-appeals and raises the following arguments: (1) the district court improperly construed the claim limitation “sampling a voltage from the auxiliary winding of the transformer and a discharge time of the transformer;” (2) the jury’s verdict that the claims would not have been obvious in view of Majid in combination with the ’876 patent is not supported by substantial evidence; and (3) the jury’s verdicts that Power Integrations did not literally infringe the claims but did infringe under the doctrine of equivalents result in claim vitiation. We affirm the district court’s claim construction and the jury’s verdict that claims 6, 7, 18, and 19 would not have been obvious. We agree with Power Integrations that the jury’s infringement verdicts vitiate the requirement that the claimed feedback signals be “distinct.” We therefore reverse the jury’s verdict that Power Integrations infringed claims 6, 7, 18, and 19 under the doctrine of equivalents. In view of these decisions, Fairchild’s appeal is moot. 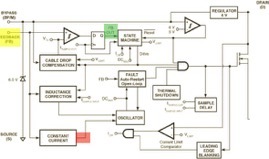 a controller to generate the switching signal and to control the switching signal in response to a first feedback signal associated with a voltage control loop and a second feedback signal associated with a current control loop . . . .
Claims 18 and 19 depend from claim 15, which includes an equivalent limitation. The patent’s Figure 3 graphically depicts the claimed voltage control loop and current control loop and their respective first and second feedback signals. The claimed "first feedback signal” is represented by the voltage VnET. VnET enters the circuit at the DET pin and is used in the voltage control loop (highlighted in green). The “second feedback signal” is represented by the voltage Vcs. Vcs enters the circuit at the CS pin and is used in the current control loop (highlighted in red). The figure shows that the two feedback signals are distinct. Fairchild asserted the ’972 patent against Power Integrations LinkSwitch-II products. Below is a block diagram of the product. At trial, Fairchild introduced evidence that the product contained the requisite two, distinct feedback signals. It identified “FB OUT” (highlighted above in green) as the “first feedback signal associated with a voltage control loop” and the output of the constant current block (highlighted above in red), which it referred to as “I REDUCE,” as the “second feedback signal associated with a current control loop.” Power Integrations countered that the product contained a single feedback signal labeled “FEEDBACK (FB)” (highlighted above in yellow)—and therefore could not infringe. The jury agreed with Power Integrations that its LinkSwitch-II products did not literally infringe the ’972 patent. However, it found that the products infringed under the doctrine of equivalents. Power Integrations argues on appeal that the jury's verdicts cannot be reconciled. It contends that, in finding no literal infringement, the jury necessarily found that Power Integrations products contain only a single feedback signal, not the two “distinct” feedback signals required by the claims. It then reasons that any finding that the single feedback signal is equivalent to the claimed two “distinct” feedback signals would vitiate the “distinct”-ness required by the claims. Pursuant to this understanding, Power Integrations argues that it is entitled to JMOL of no infringement. In response, Fairchild first argues that Power Integrations’ invocation of claim vitiation is misplaced. It states that Power Integrations presented two, separate non-infringement theories at trial: first, that the two feedback signals Fairchild’s expert, Dr. Wei, identified were not “distinct;” and second, that the current signal Dr. Wei identified as the claimed “second feedback signal” was not actually a “feedback signal.” It contends that only Power Integrations’ first theory could conceivably result in claim vitiation and argues that we should not assume the jury relied on this theory when it could have, just as easily, relied on Power Integrations’ alternate theory. The district court adopted Fairchild’s reasoning in denying Power Integrations’ motion for JMOL of no infringement under the doctrine of equivalents. We disagree with Fairchild and the district court. Power Integrations’ expert, Dr. Kelley, presented a single non-infringement theory at trial, namely, that Power Integrations’ products include only a single feedback signal. As such, the jury necessarily found that the LinkSwitch-II products contain a single feedback signal when it rendered its verdict of no literal infringement. We must therefore weigh the merits of Power Integrations’ claim vitiation argument. Under claim vitiation, “if a court determines that a finding of infringement under the doctrine of equivalents would entirely vitiate a particular claimed element, then the court should rule that there is no infringement under the doctrine of equivalents.” See Warner-Jenkinson Co., Inc. v. Hilton Davis Chem. Co., 520 U.S. 17 (1997) (“If a theory of equivalence would entirely vitiate a particular claim element, partial or complete judgment should be rendered by the court.”). We agree with Power Integrations that a finding of infringement under the doctrine of equivalents would vitiate the requirement that the claimed feedback signals be “distinct.” We therefore reverse the jury’s verdict that Power Integrations infringed claims 6, 7, 18, and 19 under the doctrine of equivalents. This case comes to our court following a series of delays, missed deadlines, and other procedural missteps by Tile Tech that are necessary to describe in full. United brought suit against Tile Tech claiming infringement its ’356 patent entitled “Support Pedestal Having an Anchoring Washer for Securing Elevated Surface Tiles.” Following transfer of the case, United served Tile Tech with its first set of discovery requests, including interrogatories, requests for admission, and requests for production. Tile Tech missed the deadline to respond to the discovery requests, and when contacted by United, it claimed that it had not received the requests. Although service of the requests was valid, United granted Tile Tech twenty additional days to respond. Tile Tech then requested two additional extensions and finally served initial responses to United nearly one month after the original response deadline. Tile Tech’s responses to United’s discovery requests were deficient. United requested a conference regarding the responses and Tile Tech agreed, but two hours before the scheduled conference, Tile Tech requested that it be rescheduled. United agreed and provided a five hour time frame on Tile Tech’s proposed date; Tile Tech responded on the proposed rescheduled date and again asked to postpone. The conference was postponed a third time, and eventually occurred following United’s warning to Tile Tech that it would file a motion to compel if Tile Tech did not commit to a time for the conference. At the conference, Tile Tech agreed to “supplement virtually every response to United’s Discovery Requests and to produce all responsive documents” by an agreed-upon date. The agreed-upon date passed with no response from Tile Tech. United offered to give Tile Tech ten additional days beyond the agreed-upon date to adequately respond. When Tile Tech again failed to respond to the discovery requests, United filed a Motion to Compel. Tile Tech never responded to the Motion to Compel. It instead served supplemental responses to the discovery requests, which were still deficient, including unverified responses to the interrogatories. The District Court took the Motion to Compel under submission, and Tile Tech proceeded to provide a third set of deficient supplemental responses. The District Court issued an Order to Compel, finding that Tile Tech had “failed to produce a single document in response to United’s document requests and had failed to supplement its deficient discovery responses,” and such actions “create . . . a waste of this court’s time.” The District Court ordered Tile Tech to respond to the discovery requests, imposed monetary sanctions, and warned that it would enter default judgment if Tile Tech did not comply with the Order by October 12, 2015, one week later. United’s attorney stated in his declaration, and the District Court found, that he informed Tile Tech’s attorney during a deposition on October 9, 2015, that the Order to Compel had issued and that it included sanctions. Tile Tech failed to respond to the Order. On October 12, 2015, United filed its Motion for Entry of Default Judgment. Tile Tech responded and claimed that it had not known of the Order’s response deadline; that it had produced a set of supplemental responses to the discovery requests; and that it required an expert opinion to fully respond to part of the discovery requests, which would be forthcoming. The District Court found that Tile Tech’s claim of producing additional responses was a “misrepresentation to the court” because no responses had been served as of the filing of Tile Tech’s Opposition to Motion for Default Judgment. In addition, the District Court held Tile Tech’s claim that it would provide an expert witness was “facially insufficient and unjustified” because the time to designate an expert witness had “long passed.” Moreover, although Tile Tech had produced only two documents during the prolonged discovery period, both of which were nonresponsive, and had not disclosed any persons with relevant knowledge in response to interrogatories pursuant to Rule 26(a)(1), it nonetheless listed over a dozen exhibits and over a dozen potential trial witnesses in its Joint Exhibit and Witness Lists disclosed at the end of the discovery period. On November 2, 2015, Tile Tech finally served another set of supplemental responses, which contained information disclosing its destruction of a previously undisclosed mold used to make one key component of the disputed support pedestal. United filed a Motion for Spoliation Sanctions, and filed an unopposed Amended Complaint adding a claim for unfair competition, to which Tile Tech never responded. The District Court later entered default judgment, granted relief for all of United’s claims, and entered a permanent injunction. Tile Tech timely appealed. Tile Tech raises two principal arguments on appeal, one concerning the entry of default judgment and the other related to the scope of the District Court’s permanent injunction. Under Ninth Circuit precedent, a court must consider the following five factors from Malone v. United States Postal Service before entering default judgment: “(1) the public’s interest in expeditious resolution of litigation; (2) the court’s need to manage its docket; (3) the risk of prejudice to the [other party]; (4) the public policy favoring disposition of cases on their merits; and (5) the availability of less drastic sanctions.” 833 F.2d 128 (9th Cir. 1987). “It is not necessary for a district court to make explicit findings to show that it has considered these factors” and, on appeal, the court “may review the record independently” for abuse of discretion. Id. The sanction of default judgment is “appropriate only . . . where the violation is due to willfulness, bad faith, or fault of the party.” Fair Hous. of Marin v. Combs, 285 F.3d 899 (9th Cir. 2002). A default judgment will be overturned “only if the appeals court has a definite and firm conviction that it was clearly outside the acceptable range of sanctions.” Hester v. Vision Airlines, Inc., 687 F.3d 1162 (9th Cir. 2012). The District Court’s opinion demonstrates its thorough consideration of the Malone factors leading to the ultimate decision not to impose lesser sanctions in this case, a decision which we find was not an abuse of discretion. Four factors favor dismissal and one weighs against dismissal. Under these circumstances, we cannot say that the District Court abused its discretion. Tile Tech argues that a default judgment was not appropriate because the District Court did not find bad faith on Tile Tech’s part. However, Tile Tech omits the full test for default judgment, which is whether a party’s conduct was due to “willfulness, bad faith, or fault.” Fjelstad v. Am. Honda Motor Co., 762 F.2d 1334 (9th Cir. 1985). Fjelstad further explained that willfulness may be satisfied simply by finding “disobedient conduct not shown to be outside the control of the litigant.” While Tile Tech has argued that its trial attorney had “unfamiliarity” with federal court practice, it has not offered any evidence to suggest that its dilatory actions were outside of its attorney’s control. We therefore uphold the District Court’s grant of default judgment. Finally, Tile Tech makes three arguments for why the permanent injunction is overbroad and should be modified, claiming: (1) it enjoins “substantially similar” products that do not necessarily infringe on the ’356 patent; (2) it requires Tile Tech to surrender the notched washer mold even though the washer by itself does not directly infringe; and (3) it prohibits Tile Tech from using images of United’s products in any marketing materials, even if there is no likelihood of confusion. We disagree with each argument. To the extent that sale, advertisement, marketing, or promotion of a substantially similar product to United’s would constitute infringement, such actions would be prohibited. We see no problem with the use of the term “substantially similar” in the injunction. We also find the requirement to surrender “any mold, or other device, by which any notched washer utilized with the ’356 patent was made” an acceptable means of preventing future infringement to United. The language of the injunction permanently enjoins Tile Tech and its representatives or agents from “any and all acts of unfair competition, including using images of United’s products, projects, and drawings on its website and in any other marketing materials.” The District Court found that the current use of United’s products in Tile Tech’s marketing materials violates section 43(a) of the Lanham Act because it “misrepresents that such products, projects, and drawings are the products, projects, and drawings of Tile Tech,” and such advertising should be removed. In sum, we find that the injunction is not overbroad as written under the facts presented. The technology at issue relates to the production of ethyl alcohol (i.e., ethanol) from a milled grain. Ethanol production yields an insoluble byproduct that deposits on, or “fouls,” the processing equipment. The Patents-in-Suit disclose methods for reducing or preventing fouling. The Patents-in-Suit are related to one another as continuations of the application that also led to the ’244 patent (collectively, “the Patent Family”). The Patent Family generally claims methods of reducing fouling through the use of phytase. U.S. Water argues that the District Court erred in granting summary judgment based on a finding that the Patents-in-Suit are inherently anticipated by Veit and Antrim. That is so, U.S. Water contends, because the District Court acknowledged the existence of a genuine dispute as to a material fact. We agree with U.S. Water. Although “the anticipation inquiry first demands a proper claim construction,” claim construction is not an issue in this case. Thus, we begin with the prior art. A reference is anticipatory under 35 U.S.C. § 102(b) if “the prior art reference . . . disclose[s] each and every feature of the claimed invention, either explicitly or inherently.” Even if a prior art reference does not explicitly disclose all features of the claimed invention, we have found that the reference inherently may do so. Inherency, however, may not be established by probabilities or possibilities. The mere fact that a certain thing may result from a given set of circumstances is not sufficient. Rather, the inherent result must inevitably result from the disclosed steps. We must determine whether the District Court overlooked a genuine dispute about a material fact—whether the reduction of “insoluble deposits of phytic acid or salts of phytic acids” as recited in the Asserted Claims was inherent in either Veit or Antrim through the use of phytase. The District Court correctly identified that “the issue on which this case ultimately turns is whether Veit or Antrim inherently disclose using phytase to reduce deposits in ethanol production machinery.” However, it erred in finding no genuine dispute of material fact as to whether the Patents-in-Suit are inherently anticipated because “the prior art discloses the conditions that will necessarily result in phytase reducing deposits.” The District Court erred in deeming irrelevant the fact that “U.S. Water . . . adduced evidence, including expert testimony, . . . that practicing Veit and Antrim will not always result in deposit reduction.” The District Court recognized this was conflicting evidence that went to the core of an inherent anticipation analysis, but concluded this evidence did not preclude summary judgment. By disregarding this evidence, the District Court improperly made credibility determinations and weighed conflicting evidence, and improperly granted summary judgment on inherent anticipation. Novozymes argues that the District Court erred in granting summary judgment of no inequitable conduct. In particular, Novozymes contends that the District Court failed to recognize a genuine dispute as to a fact material to the inequitable conduct inquiry. We disagree. “Inequitable conduct is an equitable defense to patent infringement that, if proved, bars enforcement of a patent.” Therasense, Inc. v. Becton, Dickinson & Co., 649 F.3d 1276 (Fed. Cir. 2011) (en banc). A finding of inequitable conduct as to any single claim renders the entire patent unenforceable and may render unenforceable other related patents and applications in the same technology family. A party seeking to prove inequitable conduct must show that the applicant made misrepresentations or omissions material to patentability, that he did so with the specific intent to mislead or deceive the PTO, and that deceptive intent was the single most reasonable inference to be drawn from the evidence. Ohio Willow Wood Co. v. Alps S., LLC, 813 F.3d 1350 (Fed. Cir. 2016). To prove the element of materiality, a party claiming inequitable conduct must show that the patentee withheld or misrepresented information that, in the absence of the withholding or misrepresentation, would have prevented a patent claim from issuing. Id. Novozymes bases its inequitable conduct charge on representations made by U.S. Water about the application that led to the ’244 patent and, thus, the Patent Family. Specifically, following the examiner’s rejection of certain claims in the application as obvious over certain prior art such as Veit, U.S. Water narrowed its claims to add phytase specifically to “the thin stillage, backset, or mixture thereof.” As a result, U.S. Water argued the amended claims overcame Veit, where “phytase is added before fermentation” to “release nutrients so that yeast are more efficient at fermentation.” The ’244 patent subsequently issued in October 2011 with the amended claim language. Around the same time, U.S. Water was involved in litigation against ChemTreat for unrelated claims. As part of the litigation, ChemTreat moved for summary judgment of noninfringement of the ’244 patent, arguing that the ’244 patent’s claims were limited to adding phytase after fermentation while ChemTreat instructed its customers to add phytase during fermentation. U.S. Water argued that adding phytase during fermentation was equivalent to adding phytase to the backset, i.e., the post-fermentation fluid, because it is recycled back into fermentation. During a hearing, the presiding judge questioned U.S. Water about the seemingly contradictory statements it had made to the court in the Declaration and those it made to the USPTO during prosecution of the ’244 patent. The court ultimately found that ChemTreat did not infringe the ’244 patent because it taught its customers to add phytase before or during fermentation. While the litigation with ChemTreat remained ongoing and after the court identified the apparent discrepancy, U.S. Water amended the continuation application that led to the ’137 patent. This amendment canceled all pending claims and replaced them with new claims. The new claims broadly required “adding phytase to an ethanol processing fluid in the plant.” The amended claims also identified the differences with claim 1 of the ’244 patent, which sought to narrow the claimed subject matter. A third party later identified this purported distinction to the PTO during the prosecution of the ’399 patent. In particular, the third party asserted that the claims of the ’399 patent were not limited by where the phytase was added. The examiner noted in the file history that she reviewed the third party’s submission along with Veit and other prior art references. Novozymes argues that there is a genuine issue of fact that the ChemTreat litigation documents withheld by U.S. Water from the PTO are material. Novozymes contends that the Patents-in-Suit would not have issued had the examiner been aware of these documents and disclosures. There is no genuine dispute about this material fact. The record contains no suggestion that, but-for the disclosures made during the ChemTreat litigation, the examiner would not have issued the Patents-in-Suit. Instead, the record shows that the examiner was aware of the differences between the pending claims of the Patents-in-Suit and the ’244 patent, whether as discussed in U.S. Water’s Declaration or the third party’s submission. The examiner reviewed the third party’s submission and the relevant prior art, but found that the evidence did not affect the ultimate patentability determination. U.S. Water did not withhold or misrepresent information to the PTO. Finally, Novozymes also contests the District Court’s finding of no intent to deceive the PTO. However, because we find no error in the District Court’s determination under the materiality prong of the inequitable conduct analysis, we need not address intent.